EPE is proposing a $250 million Graceland expansion on Elvis Presley Boulevard. What will it mean for Memphis? To paraphrase John Lennon's rearview summary of rock-and-roll history, "Before Elvis, there was nothing" — before Graceland opened as a tourist attraction, there was no Beale Street tourism, no Sun Studios tours, or Stax or Rock 'n' Soul museums. Elvis Presley would have turned 73 on January 8th, and it might be said that he means more to Memphis dead than alive. Music heritage, and Elvis in particular, anchors the tourism industry that generates an estimated $2.4 billion annually in Memphis. 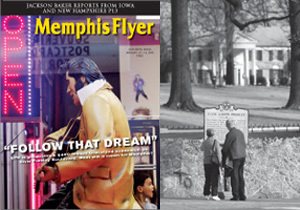 Mixed into the print-news coverage of Graceland's opening in 1982 are ads for Memphis tourist attractions that include Confederate Park, Mud Island, and the Magevney House. With all due respect to those attractions, it's hard to imagine a half-million visitors flocking to Memphis to experience them. To say that the area surrounding Graceland at 3734 Elvis Presley Boulevard has fallen on hard times overlooks an important fact: It didn't have to fall on hard times. Graceland has been there for 25 years. That Graceland manages to attract 600,000 visitors each year to this strip of used-car lots, fleabag motels, and hot-wing stands testifies to the drawing power of its late owner. But now a transformation unlike any the city has seen since the gentrification of Beale Street is afoot, with a $250 million investment to redevelop Elvis Presley Boulevard. The investor, CKX, Inc. chairman and chief executive officer Robert F.X. Sillerman, summarized the plan, saying, "It's going to be 'Oh, wow,' I can tell you that." CKX, owner of the American Idol and British Idol TV programs, paid over $100 million for an 85 percent interest in Elvis Presley Enterprises (EPE) and the commercial rights to the Elvis image nearly three years ago. Lisa Marie Presley retains a 15 percent share of EPE and ownership of the Graceland mansion. Her mother, Elvis' ex-wife Priscilla Presley, sits on the CKX board of directors. The transaction represented Graceland's arrival from locally owned cottage industry to New York media conglomerate. The artist who, in life, symbolized what writer Stanley Booth called "a certain personal freedom that's in the best of the American tradition," has become a corporate icon. State and local governments have begun the necessary legislative actions to get the project under way. Last year, the Tennessee legislature passed a bill authorizing a tourism development zone (TDZ) in the area. Among the first orders of business for the new Memphis City Council will be the consideration of motions to approve zoning changes necessary to break ground on the Graceland redevelopment. "I can't speak to the specifics as to what we're looking for from the state," explains Kevin Kern, media relations manager for EPE. "It's going to be first-class and this is going to be a catalyst for revitalization in this neighborhood." The "Oh, wow" plan includes an 80,000-square-foot visitor's center and a convention-sized hotel. Though the blueprints remain undisclosed, the power of Elvis to revitalize Whitehaven may yet rival the King's own ascent from rags to riches. While the plans should benefit the neighborhood and the local economy, they also represent a gamble for CKX. Can Sillerman, a New York media mogul, maintain the connection between Elvis and his fans and bring a new generation into the fold? "We obviously want to attract more people here as we grow our attraction. We want to make Graceland a destination where they'll spend more than just a day touring the mansion," Kern says. "Whether it's a retail component or a new restaurant, getting people to stay here longer is part of the formula. Live entertainment could very well be a component." The Elvis image wasn't always a ticket to prosperity on the Graceland corridor. The first two Elvis souvenir shops opened in the shadow of Graceland during the months following the King's death on August 16, 1977. The Graceland Gift Shop shared space with a turquoise jewelry store at 3771 Elvis Presley Boulevard, and Elvis Presley Souvenirs and Boutique opened in a former record shop and recording studio at 3787 Elvis Presley. The first shop had gone back to its old name, the Wooden Indian, by the next year. The latter held on for five years before closing. Presley fans flocked to the June 7, 1982, opening of Graceland from as far away as Tokyo, London, and Australia. The first tours of the mansion began at 8:30 that morning. By noon, an overflow crowd had packed the staging area across the street, a scene repeated thousands of times since. While the event demonstrated the King's magnetic pull on fans, the opening drew no recognition from local officials. Then city mayor Wyeth Chandler and county mayor William Morris skipped it. Despite the civic snub, Graceland sold 3,000 tickets that day at $5 apiece and turned many more pilgrims away. One visitor that day told The Commercial Appeal, "I predict this will be closed in two years. The tourists will kill it. They'll steal everything in sight." Presley's fans shrieked through entire concerts and tore at the King's clothes and hair if they could get close enough. Why would anyone think his lawn, shag carpet, or rhinestone belt buckles would fare better when subjected to 3,000 visitors a day? But fans channeled that fanaticism into reverence, as once screaming fans turned out by the thousands for solemn candlelight vigils every August and awed strolls through the King's halls. Priscilla Presley retained attorney Jack Soden to guide Graceland's 1982 opening. He stayed on board, and today he is chief executive officer of EPE. Graceland owes much of its high profile as a tourist attraction — it's the most visited private residence in the world — to Soden's management, and CKX hasn't disturbed EPE's structure, ensuring local continuity.